1. God’s grace is sufficient for navigating Life’s problems. 2. God’s goodness will follow you as you navigate life’s problems. 4 I sought the LORD, and he answered me; he delivered me from all my fears. 5 Those who look to him are radiant; their faces are never covered with shame. 6 This poor man called, and the LORD heard him; he saved him out of all his troubles. 7 The angel of the LORD encamps around those who fear him, and he delivers them. 8 Taste and see that the LORD is good; blessed is the one who takes refuge in him. 9 Fear the LORD, you his holy people, for those who fear him lack nothing. 10 The lions may grow weak and hungry, but those who seek the LORD lack no good thing. 68 You are good, and what you do is good; teach me your decrees. 3. 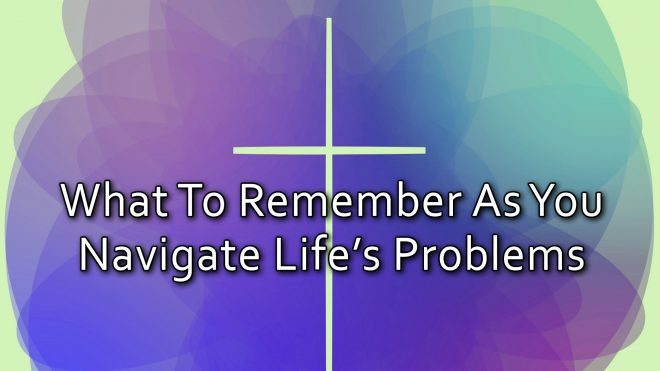 God’s glory is our goal as we navigate life’s problems. 6 Humble yourselves, therefore, under God’s mighty hand, that he may lift you up in due time. 7 Cast all your anxiety on him because he cares for you. 8 Be alert and of sober mind. Your enemy the devil prowls around like a roaring lion looking for someone to devour. 9 Resist him, standing firm in the faith, because you know that the family of believers throughout the world is undergoing the same kind of sufferings. 10 And the God of all grace, who called you to his eternal glory in Christ, after you have suffered a little while, will himself restore you and make you strong, firm and steadfast. 11 To him be the power for ever and ever. Amen.